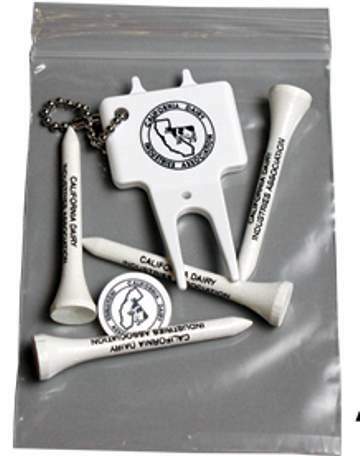 Personalized Golf Kits in Business Card Sized Pouch. Cheap, Promotional. Lowest prices in the USA, Canada. Our bulk personalized golf kits are business card sized. The transparent pouch contains 1 custom imprinted marker, 4 custom imprinted 2-1/8" long tees and 1 custom imprinted divot tool with key chain. Just the right size to add your own business card. Free artwork design. Budget Prices in the USA and Canada for wholesale personalized golf kits. Prices include your 1-color imprint on all the golf items! American clients pay no taxes. The unit prices below include your 1-color imprint on all the golf items! PRODUCTION TIME: 5-10 days after art approval; contact us for faster production. Divot Tool: 1" x 3/4"
Production Time: 5 days after art apprioval.